Most people cannot imagine life without music. We hear it constantly on the radio, TV, through our computers and iPods. However, as each song tells a story, there is often an even more amazing story behind the song that is the life story of the musician. 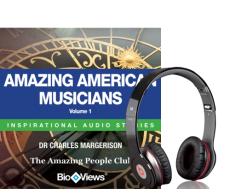 This unique audio collection from The Amazing People Club explores the life stories of three amazing musicians and reveals their challenges and what inspired them to create the music they did. Elvis Presley's life has been documented in books and films however it comes alive in a very different way through BioViews®. The life story behind one of the world's most amazing voices, Louis Armstrong's, is truly remarkable. Follow him on his journey from poverty-stricken circumstances in New Orleans to the top as one of the world's most celebrated musicians. The equally amazing career of George Gershwin, who made huge musical contributions to stage and Broadway and composed classics enjoyed all over the world including Rhapsody in Blue is also celebrated in this unique collection.